The Houston Astros are choo chooing to another World Series title, and it's a different hero this year than last. 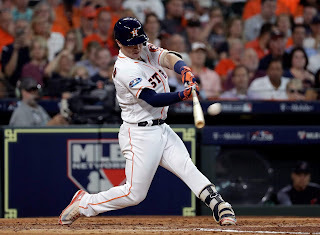 Alex Bregman has been the one steady force on a team that already featured a reigning Most Valuable Player plus two former Cy Young Award pitchers. But it was Bregman who gave the Astros a stranglehold on what turned out to be an easy sweep of the Cleveland Indians in the American League Division Series. In the first two games at home, he was 3-6, with 2 HR and 2 BB. Add 3 runs and 3 RBI and he was basically in the middle of everything. The next day when the Astros closed it out, he was on base six times (2 hits, 2 walks, 1 HBP, and reached on error). Unstoppable. And he's only 24. He's a big reason the Astros are poised to repeat as World Series Champions and is the Longhorndave Sportsman of the Week!